Maurice K. Goddard State Park is a 2,856-acre (1,156 ha) Pennsylvania state park in Deer Creek, Mill Creek, New Vernon and Sandy Lake Townships, Mercer County, Pennsylvania in the United States. It features natural beauty, wildlife, waterways and public recreational facilities. Lake Wilhelm shares its shorelines with Maurice K. Goddard State Park and State Game Land No. 270. The dam, constructed in 1971, creates a 1,860-acre (750 ha) lake providing a resource for people and wildlife. 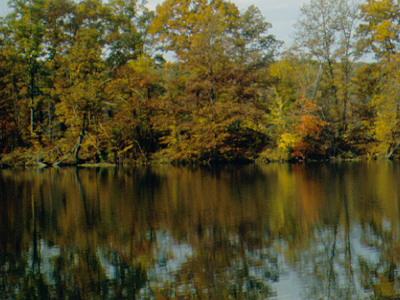 Many species of fish and amphibians make Lake Wilhelm their home. A variety of outdoor activities are available in and around the Park vicinity. The addition of the Goddard Classroom, at the Marina facility, provides the opportunity to present programs about nature, wildlife and ecology. Special events and programs are held throughout the summer months. Maurice K. Goddard State Park is just off exit 130 of Interstate 79 on Pennsylvania Route 358. Here's the our members favorite photos of "State Parks in Pennsylvania". Upload your photo of Maurice K Goddard State Park!